Vandermeer’s Annihilation is a surreal but fascinating story about a team of scientists sent to explore a mysterious place that challenges all of their techniques of analysis and meaning-making. It is also a diary novel. Vandermeer employs a first person, retrospective narrative voice — the voice of a survivor or, in this case, the only survivor of the expedition. A few pages into the novel, we learn that we have access to this voice because are reading the narrator’s journal. It is a smart move: the narrator — who is known simply as “the biologist” — is compromised early in the novel when she is infected by an unknown spore, so her perception is suspect from the beginning; she is a quintessential “unreliable narrator.” Of course, in this novel, the notion of perception and particularly of reliable scientific knowledge is always under question. The journal structure of the novel allows us entry into the mind of this character and provides an explanation and justification for the fact that a narrative exists at all, while nonetheless playing upon the conventions of the genre: its deep interiority, lack of referentiality, and, yes, unreliablility. The place the team is sent to investigate is known as Area X and its origins, boundaries, and purpose are represented as a mystery that eleven previous expeditions have attempted to decode, but unsuccessfully and with disaterous and deadly consequences. The teams are not allowed to take highly technological tools — certainly nothing involving digital or computer technology — and, as result, their experiences are to be recorded in journals which Vandermeer describes as “lightweight but nearly indestructible, with waterproof paper, a flexible black-and-white cover, and the blue horizontal lines for writing and the red line to the left to mark the margin” (8). As a manuscript geek, I love this attention to detail. Vandermeer places the biologist’s journal in the hands of the reader — we are to imagine that we are reading her handwritten account: “It was expected simply that we would keep a record, like this one, in a journal, like this one …” (8). The “one” referred to here is the book that the reader holds in her hands. But, are we reading a personal diary or a scientific record? The novel oscillates back and forth between these two roles of the journal: the biologist reveals portions of her past, her motives, and her memories — she also records her observations, questions, and theories about the strange sights she encounters. This use of the diary as scientific record evokes for me the history of early botanists and naturalists whose field journals served as fodder for their scientific writing — Darwin’s Beagle journal comes to mind. Vandermeer’s biologist is engaged in a similar effort to make sense of the world without recourse to the modern tools of analysis; the written word becomes her method, though it has a dubious value within the unstable terrain of perception depicted within the novel. In addition to writing her own journal, the biologist encounters other explorers’ journals. In a pivotal scene, the biologist discovers a stash of journals, what she describes as “a kind of insane midden” (106): “a pile of papers with hundreds of journals on top of it — just like the ones we had been issued to record our observations of Area X. Each with a job title written on the front. Each, as it turns out, filled with writing. Many, many more than could possibly have been filed by only twelve expeditions.” This discovery causes the biologist to realize that Southern Reach (the quasi-governmental body that manages the investigation of Area X) has not provided complete and accurate information about previous expeditions and therefore none of the information Southern Reach provided can be considered complete and accurate. Evidence of so many hundreds of failed expeditions also indicates that the level of danger was much higher than she previously understood; the likelihood of survival is, at this point, revealed to be slim. But beyond these realizations, there is something particularly horrific about the spectacle of the pile of journals that, I believe, hinges upon the journal or diary genre itself. When the biologist is handed her black-and-white journal by a Southern Reach official, it is implied that her experience has significance and that it will become part of the growing body of knowledge on Area X. In other words, it will be read. But, the pile of abandoned journals suggests the opposite: her experience doesn’t have value, her journal will not be read, it will end up on a pile of decomposing trash. There is something so poignant about so many life stories left to molder — it echoes for me the existential anxiety of diary writing itself: Why keep a diary? Who will read it? Does the author’s life has value? The biologist calls the journals “flimsy gravestones” (110), the devalued markers of all the lives lost in Area X, but she could speak of diaries more generally: paper gravestones, always in danger of going unread and unappreciated. At this moment, the biologist becomes not just the author of a journal but a journal reader, as well. She salvages several journals from the pile, including her husband’s (he had gone to Area X on the previous expedition). Yet she finds reading her husband’s journal difficult: “I had to resist the need to throw the journal away from me as if it were poison … He had meant to share this journal with me, and now he was either truly dead or existed in a state beyond any possible way for me to communicate with him, to reciprocate” (161). This statement — the biologist’s visceral recoil from her husband’s journal — is a wonderful encapsulation of what it is like to read another person’s diary. In my experience, it is almost impossible to not become overwhelmed by the absence of the author. Somehow, it is possible to read published books by deceased authors without sparing a thought to the fact that the author is dead but when you read a diary, the author’s absence — and the inability of the reader to cross the bridge and connect with the author, even as you read his or her intimate thoughts — is profound and sometimes paralyzing. I have only read the first volume of Vandermeer’s Southern Reach trilogy so I don’t know whether the journal format continues into the next two volumes. Certainly I hope that we haven’t heard the last from the biologist — though, given what I’ve seen in this first book, I don’t hold out hope that we will find the biologist reunited with her husband and living a quiet and still-human life on the island. 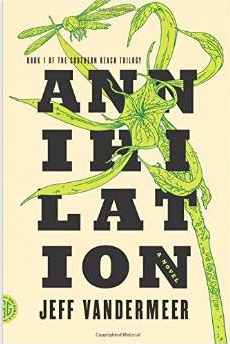 Annihilation is equal parts beautiful and terrifying, and I believe that a great deal of its accomplishment depends upon the diary structure, which Vandermeer deploys with skill and insight.